The Beacon Island Resort at Plettenberg Bay is truly a world-famous landmark and one of the most sought-after holiday destinations in South Africa. Built on a rocky promontory jutting into the warm Indian Ocean, Beacon Island's setting remains unsurpassed. 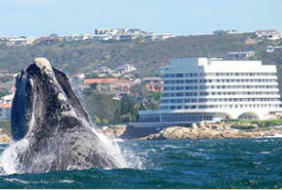 There is no better view of whales breaching or schools of dolphins than from the comfort of your room. The interior of this hotel has a modern yet relaxed simplistic look, in keeping with global trends and true to the philosophy of placing guests first, the Beacon Island remains as unsurpassed as its spectacular setting. The Sea Lounge and Playa Bar is the place to be during whale season, or any other day, it is suspended over the Indian Ocean with whales and dolphins breaching less than 30 meters away. The aim at Beacon Island Resort is quite simply to make all guests feel at home, pampered and truly cared for, to ensure that each guest's expectation is surpassed by offering a multitude of entertainment and friendly service that insures each guests is as comfortable as possible and spoilt. 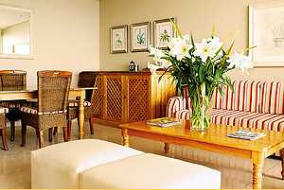 Nearby Facilities; Birds of Eden, Bowling Greens, Knysna Elephant Park, Monkey Land, Outeniqua Park, Paintball, Pitch & Putt, Plettenberg Bay Game Reserve, Rowing Boats & Canoes, Tsitsikama Canopy Tours, Tsitsikama Falls (Zip Line) Most of the tastefully decorated rooms and suites overlook the sea or lagoon, and have every modern comfort. The resort has four excellent restaurants. Beacon Island really caters to every taste and apart from warm, safe swimming in the sea, there are two swimming pools, one outdoor and one heated indoor - a separate steam room for ladies and gents, two floodlit tennis courts, scuba diving, volleyball, table tennis and squash. For the health conscious, there is a recently upgraded fitness centre and a Power Plate Studio - the hottest new high-tech fitness method available. For those wanting to unwind and relax, the Jiwu Spa and hair Salon offers a relaxing range of Spa, Wellness and Beauty treatments, these include massages, hydrotherapy, Guinot or Dermalogica Facials for men and woman, Body Treatments, manicures and Pedicures.